Hello all! I am behind once again on posting cards that I have made recently. This one in particular is the one I made for my brother's 30th birthday! He collected license plates when we were growing up, so knew the papers from DCWV's Treasures stack (available at Michaels) was perfect for his card! I added some stamps from Unity Stamp Co., a bow of Totally Black Trendy Twine, and Epiphany Crafts 14mm epoxys for added fun. The burlap strip is from DCWV's Printed Burlap 6x6 stack. 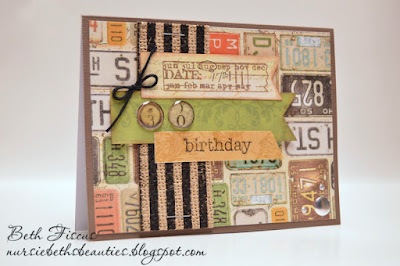 Labels: birthday, card, DCWV, Masculine, Trendy Twine, Unity Stamp Co.
Fabulous masculine card, love how you incorporated the burlap into your card! Those epoxys are adorable too! Cool card and FUN papers! 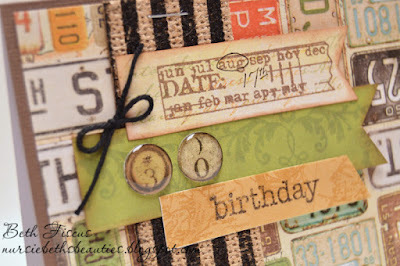 I love the burlap to and all the fun layered banners! Awesome masculine card Beth! LOVE that paper and the burlap - it adds just the right amount of texture to an already cool card!